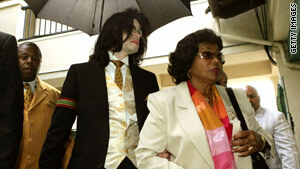 Katherine Jackson, with Michael in 2005, is challenging the appointment of Michael's estate trustees. Los Angeles, California (CNN) -- Katherine Jackson's battle for control of her pop star son's estate is about to take a "new direction" based on "new evidence" uncovered by the family, a Jackson family lawyer said. The revelation came from attorney Londell McMillan, who also corrected a report that he was one of the lawyers Katherine Jackson replaced Thursday. McMillan pointed to questions about the authenticity of the signature on Michael Jackson's will as reported this week by celebrity gossip Web site TMZ. Randy Jackson said his brother could not have signed the will -- which was dated July 7, 2002, in Los Angeles -- because he was in New York that day, according to the TMZ report. Until now, the Jacksons have not challenged the will's authenticity in court. Katherine Jackson's objections, instead, have centered on what her lawyers said were possible conflicts of interest by the two men named in the will as executors. She replaced the two lawyers who were handling the probate case Thursday with Adam Streisand, an estate litigation lawyer whose past clients have included the estates of Marlon Brando and Ray Charles. "The case is now moving in a different direction, and the family thought it was best to bring on Adam Streisand's law firm," McMillan said. "The evidence precipitated the change and the need to take it in a new direction." Contrary to statements made at court Thursday, McMillan was not one of the lawyers replaced, Katherine Jackson said Friday. "Londell McMillan remains my personal attorney and counsel," she said in a written statement. "Despite false reports, he was never replaced or terminated." The Jackson estate is currently controlled by John Branca and John McClain, who would become permanent executors unless Jackson's will is challenged. Katherine Jackson's legal team has asked that a member of the Jackson family "have a seat at the table" as a third executor. Under the 2002 will, Michael Jackson's three children and his mother are the chief beneficiaries of his estate, while unnamed charities will share in 20 percent of the wealth.